There has been a settlement in East Huntspill since Roman times. Farming has been the main occupation of the community and many of the farms date from the late 1700s. So Sunday were seen/viewed very differently from today. The Parish Church was at West Huntspill, but in 1839 a new one was built at East Huntspill and was known as a Chapel of Ease, thus making it more convenient for the parishioners not to have a long walk if they had no means of transport to their Sunday worship. Up until 1976 East Huntspill had it own Vicar. Around this time the Vicarage in Withy Road was sold, the Parishes united, with the Rector living at West Huntspill, and serving both East and West Huntspill Churches. In February 2013 we will also be joining Mark. Our new Priest in Charge - Reverend Nixon will be working with Reverend Crossman from Highbridge Church in a joint team ministry. Our Church still boasts box pews in the Nave but now has a clear area at the west end around the font which used to house old 'school type' open pews. This open area has helped to make the font more accessible for christenings and for other family type services. It has also enabled us to hold open weekends of the village and church history and for people to research family and social history at these events. Amongst the number of stained glass windows in our Church is one at the west end entitled “Suffer the little children to come unto me”. It was donated to the church by Mrs Dean in memory of her family in 1877. It had been designed by Mr Constable of Cambridge and before it was installed in East Huntspill Church had been exhibited in many places around the world including Chicago! Our Church has an east facing altar. It's bell tower and chime of eight bells, situated above the porch, donated by the late Misses Puddy in memory of their late parents Mr & Mrs Frank Puddy, was added in 1966. In 1968 the extended organ (only a few in the country) was given by the late Mrs F Case in memory of her parents and sister. In 2008 we had a flower festival to raise funds for the repair and restoration of the organ. The Churchyard is still “open” for interments, unlike some churches in the area. The Parochial Church Council is still responsible for its upkeep and maintenance. This year not only that but all the lime trees in the churchyard had to be pollard too. (Western Power having to attend to the trees with electric wires running through them.) The cost of this maintenance rises every year. As a millennium project in 2000 the trees were planted around the new extension to the churchyard with the help of Mrs Freda Welch; the late Jim Welch oversaw the making and installation of the double wooden gates; Mrs Ann Major with the help of Mr Don Eckford built the new Churchyard wall. 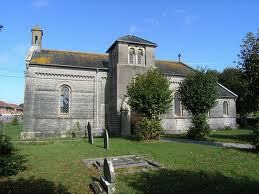 Also with thanks to Mr Roy Stenning the churchyard plan was redrawn and restored. This “new” extension was donated by the late Mr Ralph Ganfield in 1988. In 2003 the main gates, arch, light and stone pillars were refurbished and dedicated in memory of Mr Jim Welch. The lighting in the Church was updated and donated to the memory of the late Mr Bert Meaker. Where the Church/Church Hall car park is situated was once an orchard. The car park was tarmacadam and white lined in 2010/2011. Across from the Church is the Church Hall in Church Lane. This building was originally erected as a school and was used as such until 1894. The Hall is still in great demand. This year a library was installed and is open 3 mornings per week, from 10am to 12noon, on Mondays, Thursdays and Saturdays. In 2014 All Saints Church will be 175 years old. Let’s hope its’ doors will still be open and people still willing to help and donate their time and/or money to keep it that way.